Walmart is facing a battery of bad news about its treatment of employees, just in time for its annual shareholder meeting. A labor rights group says the company has an illegal sick leave policy, while workers wonder if racism plays a role in scheduling. A Better Balance, a work and family legal center, surveyed more than 1,000 current and former Walmart employees about the policy. The group found that the company routinely refuses to accept doctors’ notes, punishes workers who need time off to care for a sick family member and otherwise penalizes lawful absences covered under the American with Disabilities Act (ADA) and the Family and Medical Leave Act (FMLA), as well as other worker protections. Walmart’s employee policies are not distributed to workers, who are instead only able to access them on the company’s internal computer system, and often only when they are on-shift and management may be hovering nearby, A Better Balance found. 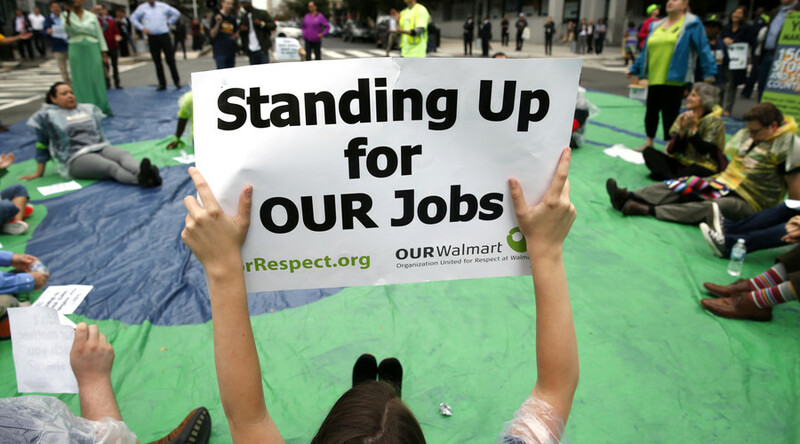 Based on the interviews with employees, the group reports that Walmart operates a point system to discipline workers. All infractions ‒ “from talking back to a supervisor or taking too long during a break, to working too slowly or being absent from or late to work” ‒ are part of this system. When it comes to absences, anything “unauthorized” ‒ defined as working less than half a scheduled shift ‒ earns an employee one point. Showing up more than 10 minutes late is half a point. Not calling to report an absence at least an hour before shift nets four points. 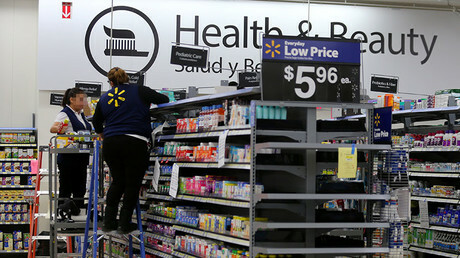 Employees who have worked for the company for less than six months are fired at four points, while those who have been with Walmart longer can accrue no more than nine points in a six-month rolling period. “I got into a car wreck on my way to work and was sent by ambulance to the hospital. I had two fractured ribs and a concussion. I reached a manager from the hospital, who said it would be OK, and I came into work the next day with wrapped ribs and a concussion. The front manager then said that they wouldn’t accept the doctor’s note from the hospital, and they fired me for missing that day,” a former employee in Oklahoma said in the report. Once employees start racking up points, they can receive disciplinary coachings, which go into their files. Having points or coachings on their records can keep workers from being assigned additional hours or receiving raises or promotions. Walmart said it had yet to see the report, but denied it punishes workers in emergency situations. 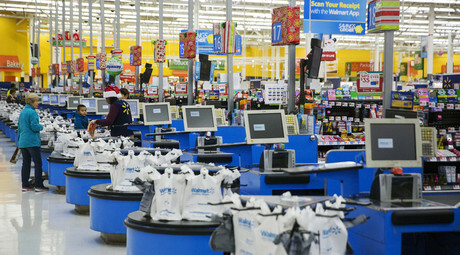 Walmart’s employees are disproportionately low-wage and women of color, the report notes. One way that workers have sought to discover just how much the company discriminates against women, especially women of color, in managers’ decisions about which employees receive part-time versus full-time hours is to get Walmart to disclose the racial composition of its respective hourly workforces. The proposal ‒ filed by Janie Grice, a Walmart worker from Marion, South Carolina, at the annual shareholders meeting in Bentonville Arkansas ‒ was opposed by Walmart management and ultimately failed. "We believe that we’re supporting diversity within our associate ranks and encouraging promotion," Hargrove, the Walmart spokesman, told Buzzfeed News. "We’ve disclosed some percentages of what we’re doing, and we’re always looking at opportunities for more disclosure and how we work with our shareholders. Creating a culture that fosters diversity and inclusion is fundamental to everything we do at Walmart." The company says it is investing in its employees with both raises and training. Earlier this week, Walmart debuted a virtual reality headset to train employees. Another proposal, which has been in testing in one Arkansas and two New Jersey stores for a month, would pay employees who volunteer to deliver packages to customers on their way home from work. Although employees would be paid extra and offered overtime as necessary, Jariwala did not outline whether they would be paid based on distance, time, number of deliveries or a combination thereof, the Washington Post reported. Labor experts question the program, noting that employees could end up shouldering much of the risk, cost and liabilities involved with the deliveries. In mid-May, two women, represented by A Better Balance, sued Walmart, claiming it discriminated against pregnant employees before a policy change in 2014. The suit seeks class-action status, and, if accepted, could include at least 20,000 women and possibly up to 50,000 who worked at Walmart while pregnant before the policy was changed. The two women are considering filing a second lawsuit over the new policy, saying it did not go far enough. In January, Walmart announced pay raises for 1.2 million of its employees, bringing wages up to at least $10 an hour. The news came just five days after the company announced it was closing 154 stores in the US and laying off 10,000 people.